H.E. Menri Yongdzin Rinpoche is the most senior teacher of the Bönpo tradition. He was born in 1926 in southeastern Tibet. 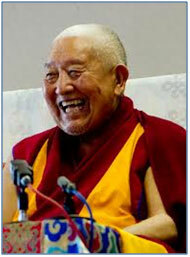 Rinpoche began his studies at an early age and took his vows at 15. He continued his studies at the major Bönpo monasteries: gYung-Drung-Ling and sMenri in Tsang near Shigatse in central Tibet. Rinpoche’s two main masters were Bonruponlob Rinpoche and the Venerable Lopon Sangye Tenzin, Rinpoche. Rinpoche was elected to the position of Lopon in 1953 at the young age of 27. This same year he obtained the Geshe degree from sMenri Monastery. As Lopon, or Head Teacher, Rinpoche is part of an unbroken lineage of 33 generations through Nyamme Sherab Gyaltsen, the founder of sMenri Monastery in Tibet. He was the teaching master from 1953 to 1957 when conflicts between the Chinese and Tibetans in Central Tibet became severe. He entered a long retreat in northern Tsang until 1960 when the Chinese invasion forced Rinpoche to flee Tibet. With great difficulty, including being shot and incarcerated by Chinese soldiers, Lopon Rinpoche was able to reach safety in Nepal. In 1961 Professor David Snellgrove invited him to London under the auspices of the Rockefeller Foundation Visiting Scholar program. He remained in England for three years, collaborating with Professor Snellgrove on The Nine Ways of Bön, the first scholarly study of the Bön tradition to be made in the West. Returning to India in 1964, Rinpoche founded Dolanji Settlement in northern India in order to give a home to the Bönpo people in exile. He returned to Europe in 1969 as a visiting scholar at Munich University to collaborate on a Tibetan-German-English dictionary. From 1970 to 1979 Lopon Rinpoche taught the monks at the Bönpo Monastic Center in Dolanji while at the same time supervising the publishing of a large number of important Bönpo texts in New Delhi. By 1978 enough texts were published to organize a curriculum around them. A traditional dialectic school was established under the guidance of Lopon Rinpoche. 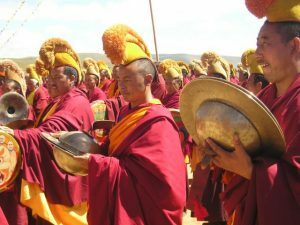 The purpose of this college was to preserve the Bönpo philosophical tradition where analysis and logic are applied to the teachings of the Sutras, the Tantras, and especially to the Dzogchen. In 1987 he founded another Bönpo monastery and International Education Center known as Triten Norbutse, near the well-known hill of Swayambhu, west of Katmandu, Nepal. 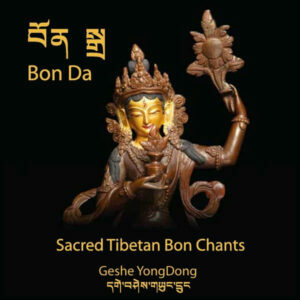 In 1992 Lopon Tenzin Namdak published Heartdrops of Dharmakaya, a handbook of Dzogchen meditation practices, from preliminaries to the most advanced Tögal practices. 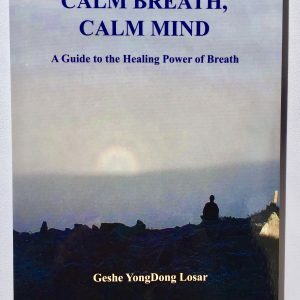 This is the first book in English that is commonly available that actually describes in detail the practices of Dzogchen. Lopon Tenzin Namdak has traveled to the West several times.